A recently built track in Blackrock. Contra-flow cycle lanes are far from new to Dublin, but is it time for the city to provide more of these cycling short-cuts? Cian Ginty reports. 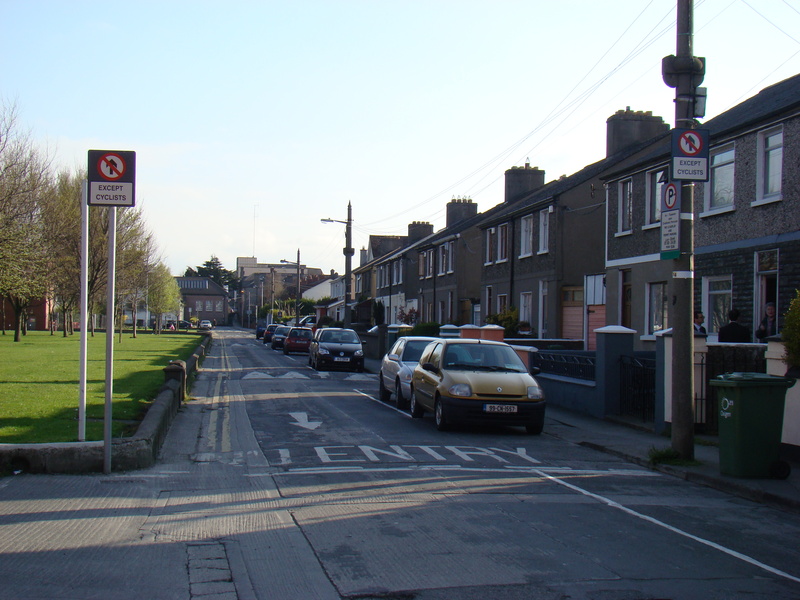 Even when driving, one-way streets can be very frustrating, but most drivers don’t realise just how much Dublin’s network of one-way streets is designed for the car. Dublin’s one-way system is extensive in the city centre area inside the canals – see the map left, showing just the multi-laned one-way streets. It’s nearly the flip opposite of the Dutch model.pedestrian’s point of view they are not great,” says Eoghan Madden, a senior engineer at Dublin City Council. Our roads were made one-way for capacity to the benefit of motorists and at a cost to everybody else – cyclists who have to live with detours, bus users who have disconnected in and outbound bus stops, and the people living on and round what amount to very urban sections of dual carriageways. Cycling friendly Dutch cities design central areas much differently. 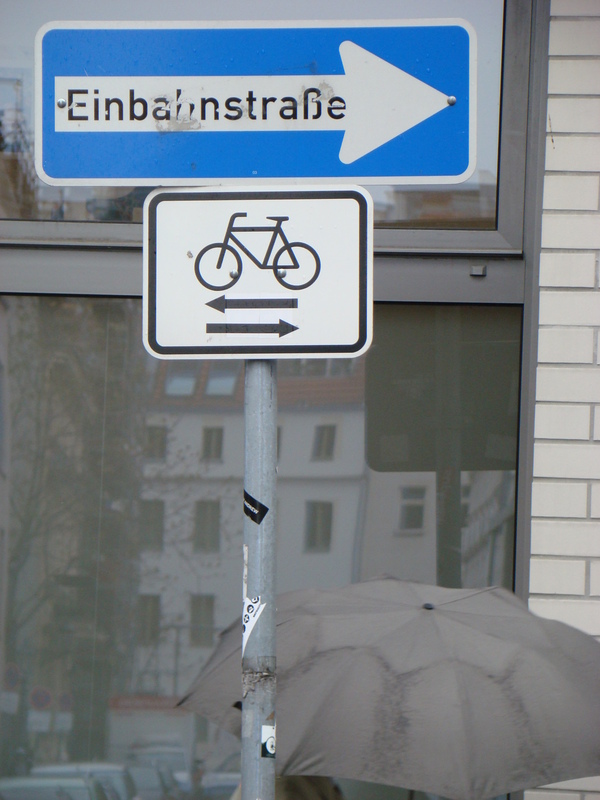 Cyclists get direct routes. City centres are designed on the principle that cars are pushed away from the centre and the one-way systems generally only apply to motorised traffic. In a way, the system of using the extra capacity is nearly ingenious in allowing the city to hold more cars than it should be able to. But it fails because Dublin is too often so close to capacity for cars that it leads to too much unpredictability when a little extra traffic or an event can cause gridlock for half the city centre. If you live, work or study on or near a one-way street, it could mean a long detour or, like in many cases in Dublin, it means being forced to cross many lanes of sometimes fast moving traffic. Other European cities such as Brussels, Paris, Berlin and to a lesser extent London have been progressive on the issue while Dublin has stalled. The latest edition of a report on cycling conditions in Dublin, published every five years, says there has been little or no progress on one-way streets and major junctions. 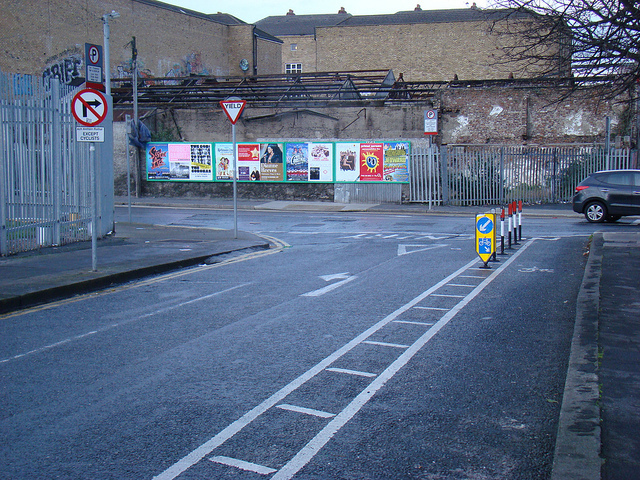 The city council had outlined a plan to allow cyclists two-way access to Westmoreland Street, D’Olier Street, Moss Street, Leinster Street South, Nassau Street, the Clarendon Street area, St Stephen’s Green, Baggot Street Lower, Merrion Row, Leeson Street Upper, Camden Street, Parnell Street, Steven’s Lane, and Watling Street. But nothing has happened since. Eoghan Madden says “it’s not off the agenda but it kind of went slow” because of planning for Metro North and Luas, but he says there should be a priority attached to implementing contra-flow lanes. “It is something that we should attach a priority to just plainly because it is perfectly obvious,” says Madden. Traffic and transport officials in Dublin have mixed opinions. Michael Aherne from the National Transport Authority is supportive at looking at the issue but seems less convinced. Andrew Montague, the outgoing lord mayor and Labour councillor, says the law needs to be changed. “On narrow one-way streets in Belgium and France the research shows that making them two-way for cyclists makes them safer for cyclists. I’d like to see on narrow, one-lane one-way streets that it would be legal for cyclists to go both ways. But that’s not a decision for the council, it’s a decision for government – we lobbied for it in the past and we’re lobbying for it again,” he says. Montague adds: “The results elsewhere show it’s safe and I’d like to see it implemented here.” But you don’t have to look elsewhere. 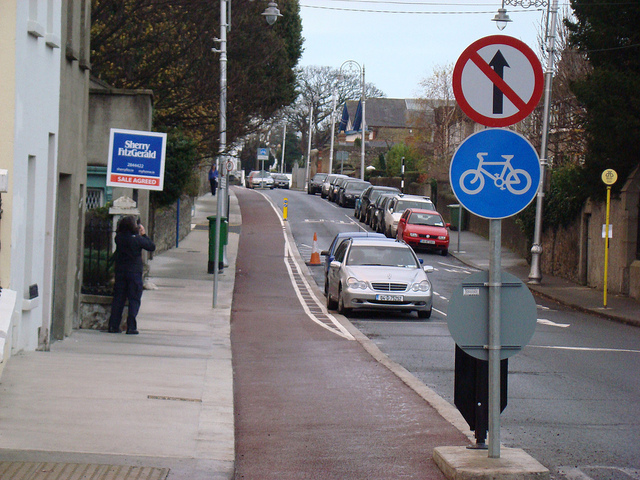 There’s at least two examples of this type of contra flow working for cyclists right here in Dublin – one in Phibsborough and the other in Terenure. These are not trials, but examples which have already stood the test of time and are now more than a few years old. 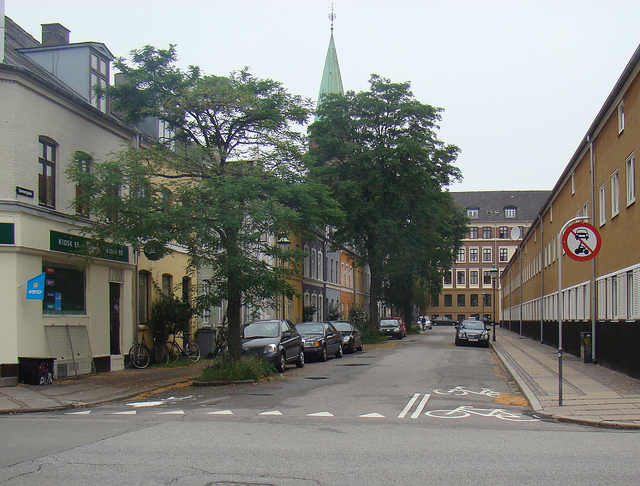 These examples are backed by legal measures – it’s under the provisions where local authorities can make a street or one side of a street no-entry except, for example, buses, cyclists, or motorcyclists. Meanwhile, Parnell Street eastbound stands as a classical example of a long detour around the one-way systems just to progress a short distance, just 100m in this case. Cyclists are sent uphill on more than a half a kilometre detour around the wide, multi-lane one-way system on Parnell Square. 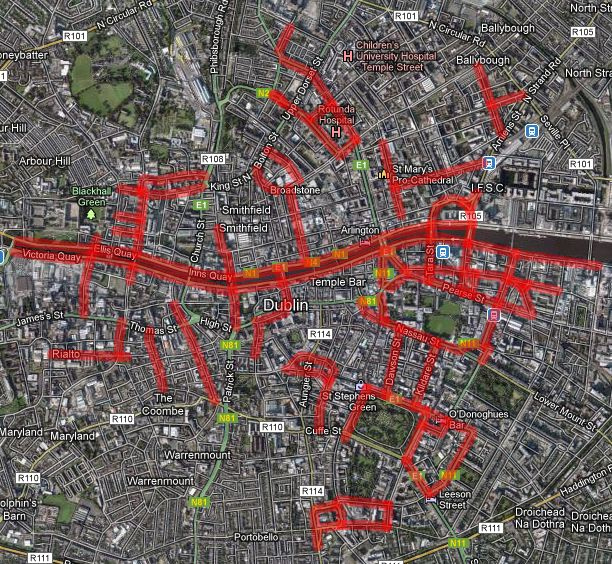 For cyclists it disrupts east-west flow as well as access to O’Connell Street. Because of the Luas and Henry Street, which is pedestrianised, there is no east-west alternative south of this point for over a kilometre and, even then, the quays is that alternative which is seen as one of the most hostile place for cyclists in the city centre. When asked about the contra-flow lanes far away from the planned Luas or stalled Metro, he says the lanes were harder to design than had been expected. “The other thing is they are hard to design. We thought we’d pick up the low hanging fruit but none of them are easy. They were much more difficult to implement than expected so there has not been much progress to it,” says Montague. “Look at the example of D’Olier and Westmorland Streets – they’ve known and talked about doing something about it for the past four or five years. I don’t there’s any willingness so far – there’s talk about it, but just get on with it,” he says. Another major problem with talking about changing one-way streets is that some people see it as contentiously providing for lawbreakers, rather than seeing it as providing for everybody including children and cyclists carrying children who prefer to avoid dual-carriageway like conditions. Allowing cyclists to avoid such unfriendly conditions was exactly what Dun Laoghaire Rathdown County Council was doing when it recently provided a segregated contra-flow only cycle path between Blackrock Village and Dun Laoghaire (pictured in the main image at the top of this page). The paper highlighted the mention by the council of the “high numbers of cyclists currently cycling illegally along” the road. This however was a footnote in the council’s consultation report, which mainly highlighted how the lane was part of a route serving Booterstown, Blackrock, Monkstown, Dun Laoghaire and Dalkey and how there is a catchment of thousands of school children, students, workers and residents within just 500m of the route. The stark cost also included a bus stop upgrade and as much new footpath as new cycle path. “I think all the difficulties were before the work and the consultation and before getting agreement,” says Conor Geraghty, an assistant engineer with Dun Laoghaire Rathdown County Council. As a Dutch cyclist living in Ireland for 5 years I think this article is pretty good. As a cyclist I am sometimes forced to choose between two evils (1 riding according the law but with the risk of getting killed by cars due to no adequate cycle lanes or cycling on the other side of the road were there is a adequate cycle lane leading to a safe crossing of the N11) So yes I am choosing sometimes against the law as the law does not provide me with the protection any cyclist deserves. So yes this will goes some frustration with the car users on the road however the car users have no idea that when I go downhill with 60 km per hour on my bicycle I am not able to stop in the same way a car would be. So please mister car driver stop putting the noses of your car on our cycle lanes and if you need to turn left doe not stop in the middle of a cycle lane just because you have no patience to wait for 10 seconds so we can pass you first. I suggest that the government is asking the cycling public how they would like to see the infrastructure of all the cycle lanes to be. Because if you never used a bicycle in Dublin you will never ever understand the way cyclists are seeing the road. Please mister goverment ask me for my opinion as I am sure I can provide you with some Dutch inside of this topic. As a pedestrian I would like to say that the number of cyclists riding the wrong way down one way streets at the moment is unsafe for the general public and I don’t feel there are stringent enough fines and chastisements in place. A number of years ago I was walking up Liffey street from the Ha’Penny bridge with my husband, a woman with two young children and a pram was approaching us on the path and after looking to see that there was no traffic coming from the only direction I thought possible I stepped out onto the street only to be hit from behind by a cyclist travelling at a very fast speed. A couple of off duty firemen picked me up off the road and checked me and the cyclist over. Although I was battered and bruised and confined to bed for a few days with stiffness all over and bruises everywhere including one unfortunate bruise that looked like a leprechaun splatted onto the centre of my back from the force of the handlebar joint hitting me what irked me most was that after accident the cyclist took off without so much as a bye your leave. From then on I have paid close attention to those who misuse one way systems and it seems that a lot of cyclists feel they are above the law and they should be made stand to account when it comes to the safety of themselves and others. Deliberately ignoring the rules of the road before contraflow systems have been put in place make the roads unsafe for everyone.